The governments of Burkina Faso and the Republic of Mali have decided to work together in the management of two Ramsar Sites which extend along the banks of the Sourou River. The Sourou Valley is one of the most important wetlands shared by the two countries. The Sourou Valley thus becomes the fourth “Transboundary Ramsar Site” in Africa. 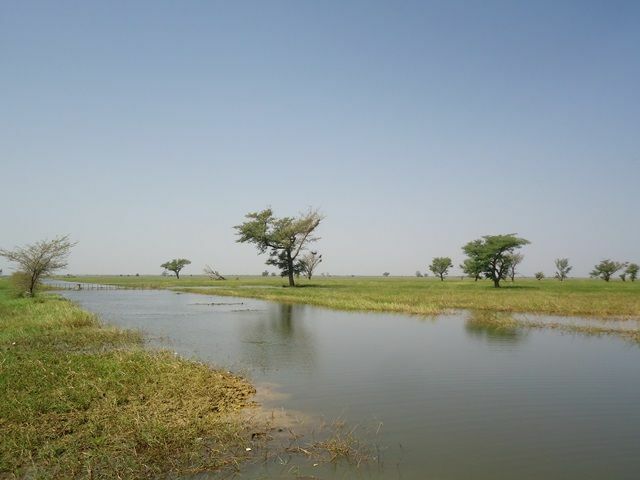 It has a total area of over 77,000 hectares and includes, in Burkina Faso, Vallée du Sourou (Ramsar Site no. 1885, area 21,157 ha), and in Mali, la Plaine Inondable du Sourou (Ramsar Site no. 2128, area 56,500 ha). The area features Sudanese savannah vegetation with a variety of threatened plants such as the shea tree Vitellaria paradoxa and animal species such as hippo, European turtle dove (Streptopelia turtur) and peregrine falcon (Falco peregrinus). It is also home to a large population of waterbirds. The natural ecosystems associated with the Sourou River have, since the colonial era, attracted the attention of the governments of both countries, which have sought to improve agricultural production in order to reduce food insecurity in neighbouring communities. As one of the large water bodies in the region, the Sourou replenishes groundwater and stabilizes the temperature, allowing for cultivation. An evaluation of the Valley’s natural resources led by IUCN in 2010 helped to raise the awareness of stakeholders of its economic value, and influence relevant plans and policies and the conservation of its natural ecosystems. The Secretariat is extremely pleased to congratulate the governments of Burkina Faso and of the Republic of Mali, and wishes them great success in their joint management and conservation of the Sourou Valley Transboundary Ramsar Site.